For help understanding your tax bill, and a link to view your current and prior tax bills, please visit the Winnebago County Treasurer's website HERE. Property assessment exemptions serve two important purposes. First, they are intended to provide tax relief to qualifying taxpayer. Second, they act as incentives for improving your property. Exemptions are available for owner-occupied properties, senior citizens, disabled veterans & non-veterans, those making improvements to their owner-occupied homes, and for religious, non-profit or charitable organizations. For additional information on exemptions, please contact the Winnebago County Supervisor of Assessments at (815) 319-4460 or visit their website HERE. Also called the General Homestead Exemption, this exemption is for individuals who own and occupy their property (as their primary residence) as of January 1st of the tax year. You can apply for this exemption anytime during the year. Once you apply for this exemption (application can be found here), it will remain in effect until the property transfers ownership. This exemption reduces the real estate value by $6,000 or the increase above the 1977 EAV, whichever is less. Similar to the Owner-Occupied Exemption, this exemption applies to Single Family Homes that are RENTED. In order for the property to qualify, the Tenant must occupy the home as of January 1st AND be liable for the payment of real estate taxes with respect to the residence in accordance with the terms and conditions of 35 ILCS 200/15-175. This exemption (application for the 2018 Tax Bill can be found here), must be applied for every year. The deadline for this application along with a copy of the lease is due by May 1, 2019. This exemption provides seniors with limited income protection against real estate tax increases due to rising property values. This exemption is NOT a tax freeze or a tax reduction and does not protect against increased taxes due to tax rate increases. This exemption provides for a base year frozen assesssment, so it can potentially provide increased savings each year a senior is eligible during times of increasing assessments. To qualify, you must have a total household income of less than $55,000 (including both taxable and non-taxable income), own and occupy the property on January 1st of the application year and the prior base year, and be liable for payment of real estate taxes on the property. In some cases, the surviving spouse of an eligible senior citizen may qualify. To apply, senior taxpayers must complete an application affidavit (pink PTAX 340 form). This form must be signed and notarized. Income from all household members needs to be itemized and totaled for the year prior to the applicaiton year. This exemption is required to be filed for every year by the July 1st deadline. Applications are mailed by the Supervisor of Assessments to those senior taxpayers who had the Senior Citizen Assesment Freeze Homestead Exemption the prior year. UPDATE: Per the Winnebago County Press Release (link here), a new law came into effect for the 2018 tax year (payable in 2019) which changes the maximum total household income eligible to qualify for the exemption from $55,000 to $65,000. The $55,000 limit is still in effect for the 2017 tax year, payable in 2018, and earlier years. 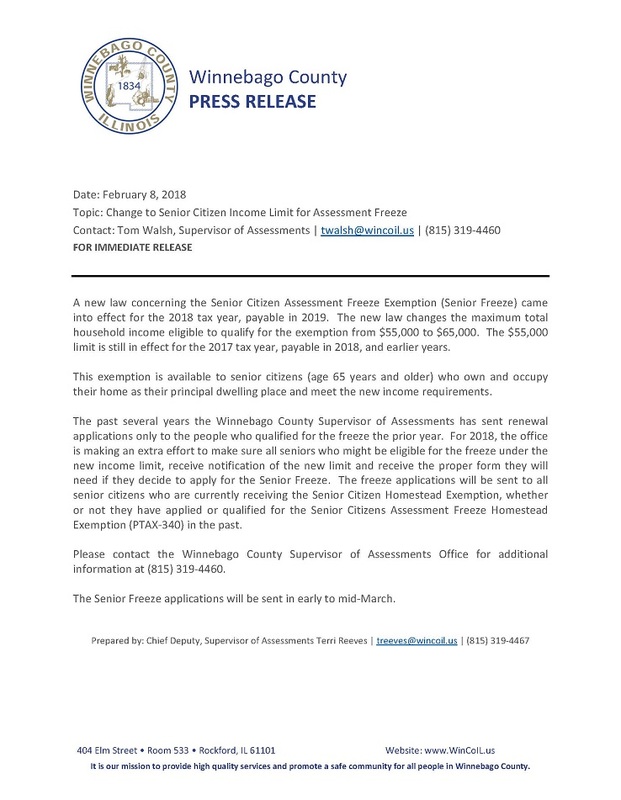 Seniors who may be eligible for this exemption should receive notifciation from Winnebago County by mid-March 2018. The 2018 Assessment Freeze Application can be found here. This program allows a qualifying senior to defer payment of real estate taxes on his or her personal residence. During the deferment period, the State of Illinois pays the real estate taxes. Then when the senior sells the property or within a year of his or her death, repayment plus an interest payment calculated at 6% annually is made. To qualify you must be age 65 or older by June 1st of the year for which the application is made, have a total household income of less than the maximum allowable limit, own and occupy the property, have lived in the property or other qualifying property at least 3 years, be liable for payment of real estate taxes on the property and have no delinquent real estate taxes. Application (which must be filed by March 1st) and guidelines are available from the Winnebago County Treasurer, 404 Elm Street, Room 205, Rockford, IL 61101. Please contact the Winnebago County Treasurer (815) 319-4400 with any questions. A 2 year, $5,000 per year, EAV reduction for the first and second year that the veteran (or spouse) owned the home after the veteran returns from active duty in an armed conflict. To receive this exemption, the veteran must file an application upon their return home. Effective July 1, 2012, the state of Illinois cut funding for the Circuit Breaker Property Tax Relief grant.